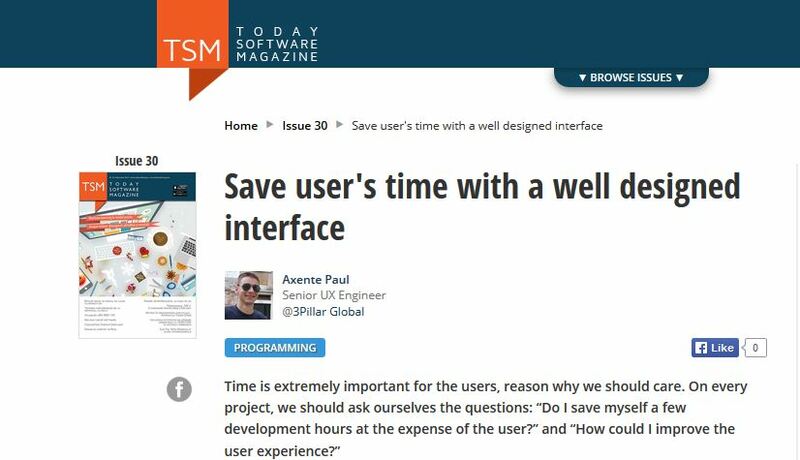 3Pillar’s Paul Axente, Senior UX Engineer, wrote an article for the 30th issue of Today Software Magazine, a popular magazine for IT professionals in Romania. Through this article “Save user’s time with a well designed interface,” Paul reiterates the importance of a user-centric interface. Paul believes that developers should move away from the mindset of saving a few development hours at the cost of designing an interface that can save precious time of the end user. We have milestones to reach, demos to make, bugs to fix and, if these weren’t enough, we also have Internet Explorer. He mentions in this article how someone like Steve Jobs was so obsessed with designing products that saved user time that the former Apple CEO insisted on improving the booting time of the Macintosh, going as far as suggesting that particular tweak could end up saving lives. To get an elaborate explanation on each of the above bulleted points, read the full article on the Today Software Magazine website.